An adaptive symbol mapping scheme is proposed for single-user point-to-point and multiuser downlink multiple-input multiple output (MIMO) systems aiming at the minimization of the overall system bit error rate. The proposed scheme introduces a disorder to the symbols to be transmitted within a MIMO subframe by means of dynamic mapping, with the objective to optimise the interference between them and enhance the received symbols' power. This is done by either changing the allocation order of the symbols to the antennas or by applying a scrambling process that alters the symbols sign. This procedure is targeted to optimizing, rather than strictly minimizing the interference between the symbols such that constructive instantaneous interference is utilized in enhancing the decision variables at the receiver on a symbol-by-symbol basis so that detection is made more reliable. In this way, the overall system performance is improved without the need to raise the transmitted power. The proposed scheme can be used in conjunction with various conventional MIMO precoding and detection techniques. The presented results show that for a given transmit power budget this scheme provides significant benefits to the corresponding conventional system's error rate performance. The recent advances in multiple-input multiple-output (MIMO) processing  are making the application of multiantenna transmitters and receivers increasingly popular in modern wireless communications due to the enhanced capacity and space diversity they offer. MIMO schemes have recently been incorporated in communication standards such as WiMAX and 3GPP-LTE to satisfy the growing demand for higher data rates and quality of service for multimedia applications. Despite the increased information capacity offered by the MIMO channel, the spatial correlation of the multiple subchannels introduces an additional source of interference which corrupts the data symbols and in effect degrades the achievable error rate performance of such systems. In the MIMO uplink, space diversity detection techniques [2–5] can counteract this impediment to a satisfactory extent. In [2, 3], the sphere decoder is presented for an arbitrary lattice code and a lattice code resulting from applying algebraic space-time coding on a MIMO system, respectively. Regardless of the technique's near-optimal performance, the decoding complexity is quite significant, which makes it impractical for use in mobile units at downlink and point-to-point reception. Suboptimal solutions with reduced complexity are introduced in [4, 5] where diagonal- and vertical-layered architectures of the (Bell Laboratories Layered Space Time) BLAST receiver are presented, respectively. While complexity is drastically reduced the performance of these techniques is comparable to the sphere decoder in most practical scenarios. An alternative to MIMO detection is to shift the signal enhancement processing to the transmitter by use of precoding. This is particularly popular in MIMO downlink communications and point-to-point systems, which is the focus of this work. Channel inversion (CI)  entails the least complexity of the precoding techniques available. However, the disadvantages of the CI technique include a poor symbol error rate (SER) performance and the fact that the transmission rate and throughput delivered are limited and do not improve by increasing the number of antennas, as demonstrated in . The solution proposed in , which is a minimum mean square error (MMSE) form of channel inversion, provides some performance and capacity gains with respect to the conventional CI, without a considerable complexity increase. Nevertheless, the transmission rates offered by both these schemes are far from reaching the theoretical channel capacity. Dirty paper coding (DPC) techniques as, for example, in [8–11] based on the initial information theoretical analysis in , can further increase transmission rates and achieve significant capacity benefits. However, the majority of the DPC methods developed so far are impractical in many scenarios as they require sophisticated signal processing at the transmitter with complexity similar to the one of sphere decoding. A promising alternative is the joint transmit-receive beamforming scheme as presented in  amongst others in the literature. Despite being less complex than DPC, the most robust beamforming schemes require iterative communication between the transmitter and receiver for the optimization of the joint processing and the system configuration. This needs to be done every time the channel characteristics change and hence, in fast fading environments introduces considerable latency to the MIMO downlink system. Owing to their favourable performance-to-complexity tradeoff amongst the techniques mentioned above, this paper focuses on the application of the proposed scheme to the more practical V-BLAST detection and MMSE precoding. Complementary to the aforementioned signal enhancement processing MIMO schemes, a number of resource allocation schemes [14–19] have emerged for MIMO communications mainly involving antenna selection [14–16] and power allocation [17, 18] for multielement transceivers as well as frequency (subcarrier) allocation  for MIMO-orthogonal frequency division multiplexing (OFDM) communications. All the relevant resource allocation methods focus on the reduction of interference between the spatial streams of the MIMO channel. 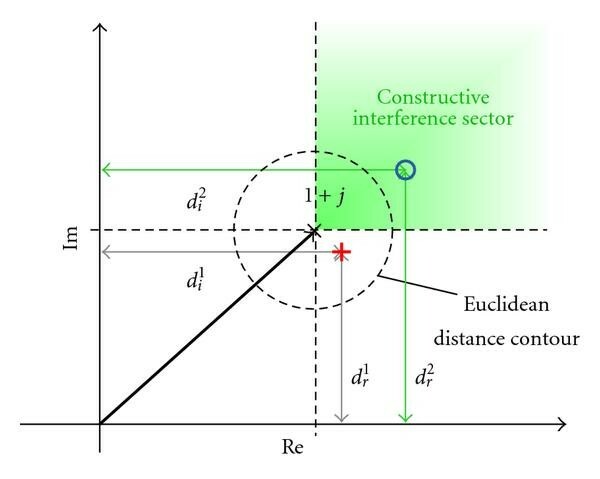 This clearly differentiates them to the proposed scheme where the aim is not strictly to minimise the correlation of the spatial streams but rather to optimise it and accommodate for constructive interchannel interference (ICI). Moreover, resource allocation schemes such as antenna selection can be used in addition to the proposed technique to further improve the performance. The focus of this paper, however, is on signal enhancement schemes and for reasons of coherence, antenna selection and power allocation are not considered here. In more detail, the proposed scheme which parallels the ones in [20, 21] proposed for code division multiple access (CDMA) is based on the fact that ICI is separated into constructive and destructive as discussed in detail in . The characterisation of the instantaneous ICI depends on the channel characteristics and the correlation between the spatial streams, and, equally importantly, on the instantaneous values of the transmitted symbols. By perturbing the data symbols to be transmitted by means of reordering or scrambling, the proposed scheme influences the ICI between the MIMO subchannels. It then chooses a symbol mapping such that the interference is optimised and the decision variables at the receiver are maximised. Subsequently, conventional precoding or detection can be applied with enhanced performance due to the optimisation of interference achieved by the proposed symbol mapping. It is clear that the proposed symbol mapping scheme can be combined with various conventional MIMO detection (linear detection, V-BLAST, sphere decoding, etc.) and precoding schemes (linear precoding, dirty paper coding etc.) to improve the respective performance. For reasons of simplicity and to maintain the focus of the present paper, as mentioned above, only two of the most practical and popular MIMO techniques are considered here, MMSE precoding and V-BLAST detection. It should be noted that the proposed data allocation method entails the transmission of control signalling (CS) to inform the receiver about the mapping process used so as to attain the correct initial order or appropriately descramble the received data after detection. It will be shown that the CS increases logarithmically with the number of candidate mapping patterns and for this reason the number of possible reordered or scrambled versions of the data to select from should be limited. In the simulations presented here this number is limited to values such that the overhead imposed by the CS transmission is restricted to less than 6% of the transmitted information. Here and is the matrix that contains the complex frequency flat channel coefficients with the element being the zero-mean unit-variance channel tap between the transmit antenna and the receive antenna. Also, is the vector with the symbols transmitted by the antennas and is the vector of the additive white Gaussian noise (AWGN) components at the antennas. For reasons of completeness and to introduce the notation used in this paper, the following briefly presents the conventional MMSE precoding and V-BLAST detection schemes. A modification to the conventional V-BLAST is also introduced to make it more compatible with the proposed method. where represents the quantization operation. It is shown in  that the value of that maximizes the received SINR is , where is the noise variance at the receiver. It is demonstrated that this precoding outperforms full channel inversion in symmetric MIMO systems where such as the ones investigated here. where is the crosscorrelation of the remaining symbols at the cancellation iteration, and is the noise component after channel equalization. It can be proven that the noise component has on average increased power compared to after multiplication with the nonunitary channel equalization matrix. In both (4) and (9) it can be seen that when the transmitted data symbols are reordered they are paired with different crosscorrelation elements in the crosscorrelation matrix and the interference between them changes so that the values of the resulting decision variables are different. Hence, instead of transmitting the symbols as they appear at the output of the information source, it would be beneficial to the communication system to reorder the symbols in a way that the decision variables resulting from (4) and (9) are enhanced. This serves as the motivation behind the proposed SA scheme, the flow diagram of which is illustrated in Figure 1. The proposed algorithm involves the following steps. From an initial reference symbol-to-antenna allocation pattern a limited number of candidate allocation patterns are formed offline, known both to the transmitter and receiver. The value of should be limited, so that the CS bits (needed to convey which of the candidates was used to the receiver) do not impose an overwhelming transmission overhead. Block diagram of the proposed symbol allocation (SA) scheme. For each candidate the expected decision variables are preestimated according to the signal enhancement mechanism employed (precoding or detection). For the MMSE and V-BLAST techniques considered here the preestimated symbols are given by (6) and (8d), respectively using the channel estimates. The vectors containing the decision variables for each candidate allocation are stacked to form the matrix . The column of the matrix, denoted as for simplicity, contains the preestimated decision variables for the candidate symbol allocation with . A symbol allocation is selected based on an error rate minimization criterion that will be shown in the following. The transmitter subsequently allocates the symbols to the antennas based on the selected allocation and, if applicable, precodes the data using some form of conventional precoding. Additional to the data symbols the transmitter sends the CS bits that inform the receiver which of the candidate allocation patterns was used. The receiver applies the conventional signal enhancement processing which can be V-BLAST (assumed in this paper) or any other conventional detection scheme to acquire the enhanced decision variables. The CS is detected to determine the allocation used at the transmitter. Using the knowledge of all possible allocation patterns, the receiver then removes the perturbation introduced at the transmitter by inverting the process of to retrieve the original data. For reasons of clarity the separation between the notations and in the above analysis should be emphasized, as the former represents the preestimated values of the data at the transmitter using CSI and ignoring noise while the latter denotes the actual estimated data at the receiver. It is evident that for each allocation pattern used, a number of control signaling bits need to be transmitted additionally to the information symbols to notify the receiver which of the candidate allocations was selected. Therefore if the proposed SA was applied at individual symbol periods, in realistic MIMO scenarios with limited number of antennas the need to map the symbols at each symbol period would yield a significant amount of CS. To limit the signaling overhead to practical levels, rather than applying the proposed SA on a symbol-by-symbol basis, symbols of multiple transmission time slots and spatial layers are grouped to form MIMO subframes, similar to the ones used in the LTE standard. By applying SA on these subframes and increasing the number of data information symbols per allocation the relative CS overhead is dramatically reduced. As regards the mapping mechanism used to create the candidate allocations and introduce the diversity in the resulting interference to optimize the decision variables, this paper proposes two distinct methods which are analyzed below. different reordered versions of the subframe. Nevertheless as mentioned in the previous section the number of candidate allocation patterns needs to be limited in order to restrict the resulting CS overhead. It will be shown however in the results section that the performance benefit provided by SA, while less than the theoretically achievable for , is still considerable compared to conventional MIMO schemes. Mapping methods: (a) symbol reordering, (b) symbol scrambling. different possible scrambled versions. It will be shown however that the performance of the proposed scheme depends on the number of actual candidate perturbed versions of the frame rather than the theoretical achievable diversity. Therefore for a practical number of candidate allocations the performances of the two mechanisms are identical as shown in the simulations that follow. The advantage of the scrambling method however lies in the fact that since the symbols arrive at the receive antennas at the initial time slots and spatial streams there is no need for the antennas to cooperate for retrieving the actual order of the transmitted data. This makes the proposed scheme also applicable to multiuser MIMO downlink transmission. When the projection of the preestimated decision variable on the actual symbol to be transmitted is negative it signifies that due to ICI the decision variable is corrupted and would indicate a different constellation point than the one transmitted which would lead to erroneous detection. When the projection is positive the ICI does not push the decision variable to a different constellation point and in the absence of noise detection is expected to be successful. The higher the value of the projection the more reliable the decision variables are expected to be. Hence the minimum of the projection for each candidate denotes the most unreliable (worst) symbol in the distribution . By selecting the candidate allocation with the highest minimum projection for every subframe the performance of the instantaneously worst symbol is constantly enhanced and therefore the overall average performance is boosted. Euclidean distance versus projection criterion, QPSK example. To verify the superiority of the proposed criterion over the conventional approach, the two criteria (14) and (15) are compared in the results that follow. It should be noted that since the search for the best candidate is not exhaustive amongst all possible perturbed symbol allocations but rather between possibilities—to limit the CS-the selected candidate may be suboptimum. It is shown in the simulations however that even for this suboptimal selection a significant performance improvement can be gleaned. As regards the selection of , the obvious method for this is to calculate in (15) for each symbol period. An alternative would be to calculate for all symbol combinations for a given channel impulse response and store the values of in a memory, possibly in the for of a lookup table (LUT). For each symbol period the transmitter would then select the appropriate value of from the LUT according to the symbol combination encountered. For QPSK modulation and assumed in the following results the number of possible symbol combinations would be . However, for PSK modulation the interference encountered depends only on the relative phases of the data symbols and not their amplitudes which are common for all constellation points. Hence different data symbol combinations that share the same relative phases such as and would yield the same value of . Clearly there exist relative phase combinations arising from each of the QPSK constellation points. Hence, a total number of entries need to be calculated and stored in the LUT. This LUT-based implementation of the allocation selection is particularly preferable in slow fading cases where the channel coefficients remain unchanged for large numbers of symbol periods and large framelengths can be used. 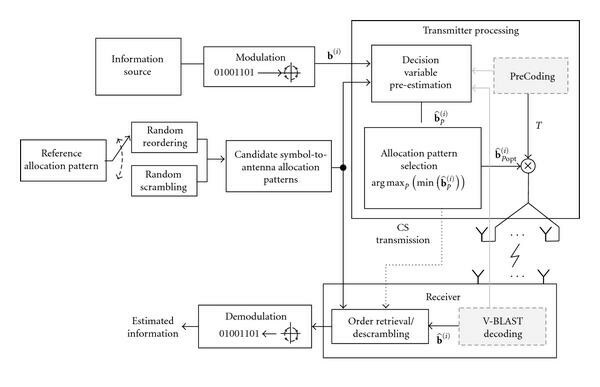 It is evident from the aforementioned analysis that the performance of the proposed scheme relies on the transmission of CS to update the receiver on the allocation pattern used at each symbol period in order to correctly remove the perturbation introduced at the transmitter and obtain the initial data. It is possible to attach the CS at the end of the corresponding subframe but for reasons of efficiency it is preferable to adopt a frame-based approach as the one shown in Figure 4. The MIMO frame consists of subframes each one comprising symbol periods over spatial streams. The CS is calculated for the whole MIMO frame and is transmitted at the beginning of the frame. This facilitates the perturbation removal at the receiver as the whole frame can be processed uniformly in order to avoid subframe-by-subframe CS transmission and detection. The CS is transmitted separately to the data to avoid interference so that CS detection is reliable. Likewise, at the receiver a number of CS symbols need to be detected for every received data symbols which gives an equal reception efficiency. In the majority of the following simulations a data subframe of symbol periods over spatial streams is assumed and a number of candidate allocations is used. As QPSK modulation is employed for both data and CS this derives a practical transmission and reception efficiency of %. At this point is should be mentioned that a 5.4% efficiency reduction, while nontrivial, is worthwhile due to the significant performance improvement attained by the proposed scheme. Indeed, it is not uncommon to sacrifice a degree of transmission efficiency to secure performance benefits and a profound example of this is forward error correction (FEC) coding. While it imposes major transmission overheads such as 33% for codes of rate , 100% for rate and so on, it greatly improves communications system performance. This is why FEC is adopted in most modern communication standards and its importance is widely acknowledged. Furthermore, the transmission efficiency of the proposed scheme in (17) can be improved by increasing and employing higher-order modulation such as 16-quardature amplitude modulation (QAM) or 64QAM. This is further illustrated in Figure 7 (and the relevant discussion in the following) which plots the transmission efficiency with increasing for the parameters mentioned above and for various modulation schemes used for the CS transmission. For the case of fast fading where channel estimation and precoding matrix calculation (steps 1, 2, 3, 5 in Table 1) need to be done more frequently, the weight of the factor that relates to the complexity increase for the proposed scheme in (18) is reduced. Therefore, the relative complexity increase for MMSE-SA compared to MMSE is drastically reduced. It should be mentioned that in the cases where the proposed scheme is applied on the MIMO downlink by use of scrambling the discussed complexity increase has less of an impact as it involves the base station transmitter where resources are more affordable. Moreover, by use of the LUT-based approach discussed in Section 4.2) the complexity of the proposed scheme can be further reduced. Overall, the raise in complexity is well justified by the performance benefits provided by the proposed technique as will be shown by the results. Complexity in numbers of operations for MMSE and MMSE-SA. In (24) is the amplitude of flat fading, is the energy per bit, is the noise power spectral density and denotes the expected value of . The probability of symbol error for QPSK modulation used in the simulations below can then be simply calculated using (22) and (23) for . It can be observed that as the signal to noise ratio (SNR) increases and the CS detection becomes more reliable tends to zero for which case (21) yields . The value for the proposed SA scheme is dependent on which of the investigated conventional techniques are used and how SA enhances performance. It is obvious that for nonzero , but the following simulations show that with the proposed SA the data detection error probability is severely reduced compared to the corresponding conventional techniques. Hence for SA is still significantly less than the error probability of the conventional methods. The exact error probability cannot be calculated in closed form due to the fluctuations in the symbol allocation and the instantaneous crosscorrelation values between the symbols. Therefore, an exact expression of the final error probability for imperfect CS detection cannot be derived. Simulation results are provided in the following section for the proof of the proposed method's superiority. This section presents the results of Monte Carlo simulations carried out for conventional MIMO precoding and detection schemes with and without the proposed SA for various numbers of antennas on frequency flat fading MIMO channels in order to illustrate the relevant performance comparison. 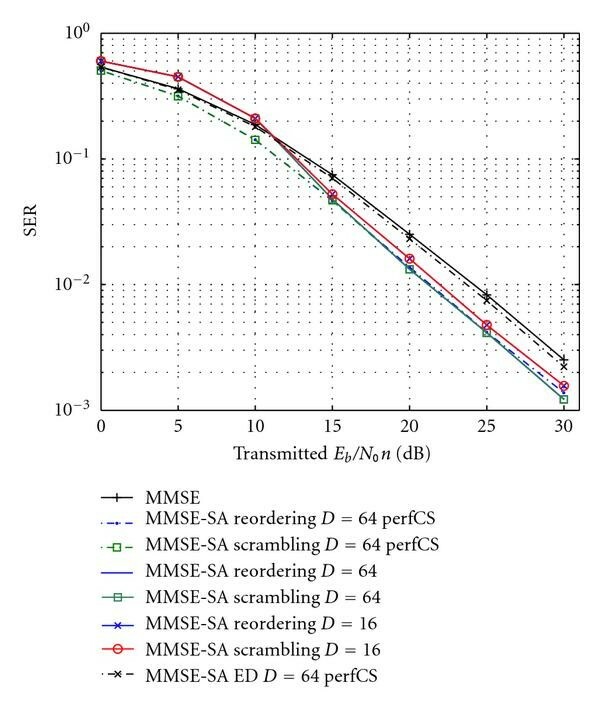 While it is intuitive that the benefits of the proposed scheme extend to a variety of MIMO techniques, the simulations below focus on MMSE precoding and V-BLAST detection, as these schemes offer a practical performance-to-complexity tradeoff. For the simulations shown QPSK modulation has been employed and unless stated otherwise perfect channel estimates are assumed. For the transmission of CS an increased transmission power by a factor of two compared to the data transmission is assumed, which is a common method in practical systems to achieve reliable CS and eliminate the effect on data detection. To avoid confusion it should be clarified that to ease comparison to the results of [5, 9] the total transmitted SNR is used in the graphs for MMSE precoding while the values of transmitted SNR per receive antenna are used in the graphs for V-BLAST detection. 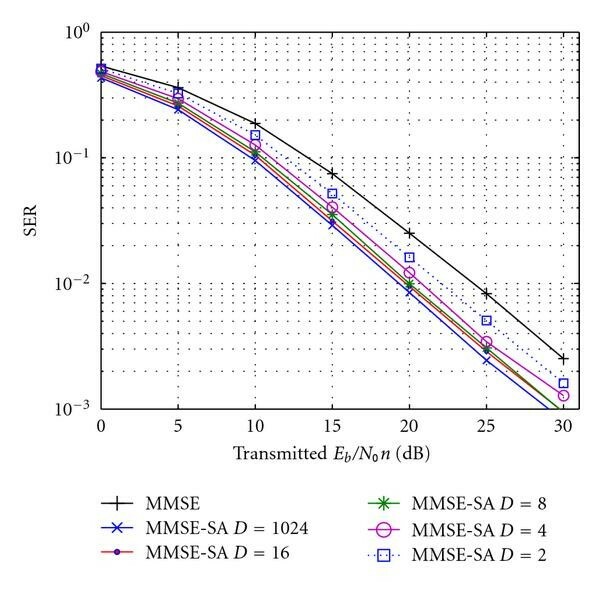 As an initial point and to quantify the absolute performance benefit achievable by SA on MMSE precoding Figure 5 depicts the performance of MMSE-SA on a MIMO symbol rather than on a MIMO subframe basis ( ) for a system with . In the results shown here the symbol allocation is optimized at every symbol period and the candidates are increased up to the maximum possible . In realistic scenarios this would impose a significant amount of CS which renders the SA scheme impractical. Hence the result here is shown for reference purposes only, ignoring the need for CS transmission. It can be seen that the benefit achievable for maximum is almost 5 dB. It is worthwhile to note that drastically decreasing the candidate allocations to and imposes only an insignificant performance loss. The performance gain is halved however when . SER versus SNR for MMSE, MMSE-SA for increasing , , , QPSK. A profound insight of the performance to transmission efficiency tradeoff can be attained by Figures 5 and 6 where the symbol error rate (SER) performance and transmission efficiency are shown for increasing values of , respectively. The same MIMO system is considered but in this case a subframe-based optimization of the symbol allocation is employed as the one analyzed in Section 5. A subframe length of time slots is assumed which derives a number of data symbols per subframe. 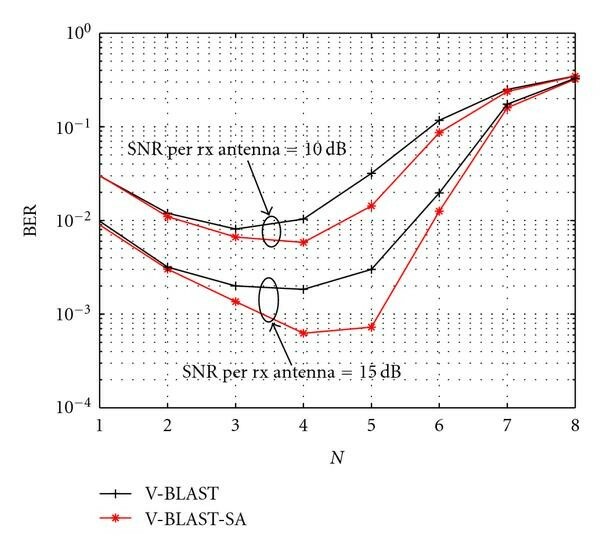 In Figure 6 the performance of MMSE precoding is shown for a total transmitted SNR of 20 and 25 dB and the performance of V-BLAST is included for transmitted SNR per antenna of 20 dB. It can be seen that for low values of the performance gain for increasing is significant while at higher values of and this benefit saturates. 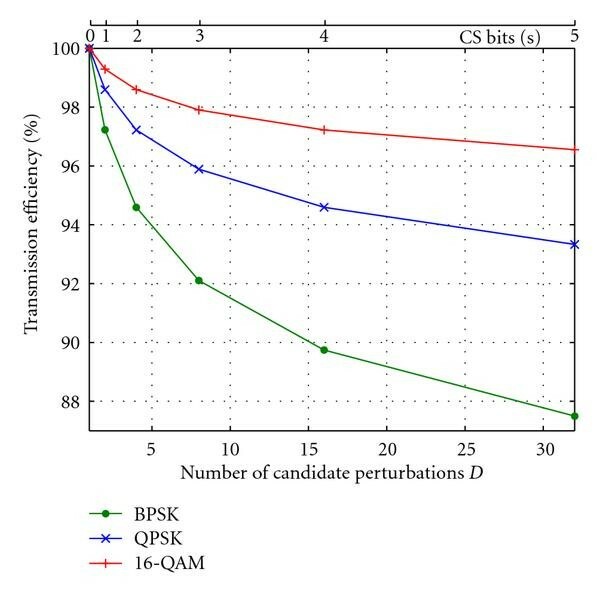 Considering the transmission efficiency diagram of Figure 7 and especially the curve for QPSK modulation of the CS bits it can be seen that the reduction in efficiency is considerable between and . Therefore it can be concluded that for the system investigated in the majority of simulations in this paper, for which and , the value of provides a favorable performance-to-efficiency tradeoff. Hence, unless stated otherwise it is the one used in the following simulations. For this case the relevant transmission-reception efficiency of (17) is %. It is apparent in Figure 7 that the transmission efficiency can be increased by using 16QAM modulation which for this value of gives % in the graph yielding less than 3% of overhead. 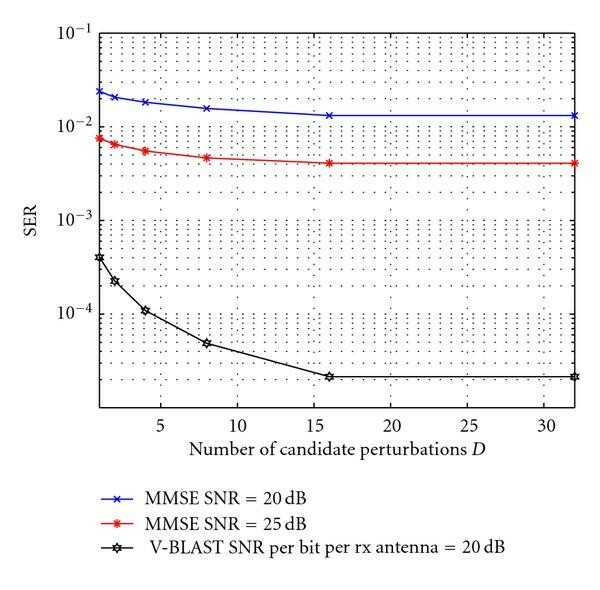 SER versus for MMSE (SNR = 20 dB, 25 dB) and V-BLAST (SNR per rx antenna = 20 dB) using SA, , , QPSK. Transmission-reception efficiency for SA for increasing , , , QPSK. The SER versus transmitted SNR performance for MMSE is shown in Figure 8 for the same system of , . The graph depicts the performance for both mapping mechanisms of Section 3, namely reordering and scrambling and it can be seen that for the same value of both perform identically. Hence the results confirm that as mentioned above, it is the value of that makes the difference in performance rather that the mapping method used. Moreover, to illustrate the superiority of the proposed projection criterion (15) over the Euclidean distance (ED) criterion (14) for the selection of , the performance of the latter is also included for the case of error-free CS. It can be seen that the ED criterion only provides a minimal improvement with respect to the performance of the conventional system, while the existence of constructive interference for the proposed criterion offers a notable improvement. The performance of the system with error-free CS transmission is also depicted for comparison. It can be viewed that the negative impact of the CS transmission on the performance of the system is apparent at low SNR values where CS detection is problematic, while it becomes negligible for higher SNRs where the CS detection is reliable. As a result, for low SNRs the proposed technique is outperformed by conventional MMSE precoding due to the unreliability of the CS transmission. However, for the higher SNR values a considerable SER reduction can be observed which yields a 2 dB gain in the transmitted SNR for for this 5×5 MIMO system. A 2.5 dB gain can be attained by allowing a reduction of the transmission efficiency using for the same system. SER versus SNR for MMSE, MMSE-SA with reordering or scrambling, projection-based optimisation and MMSE -SA with Euclidean distance (ED) optimisation , , QPSK. 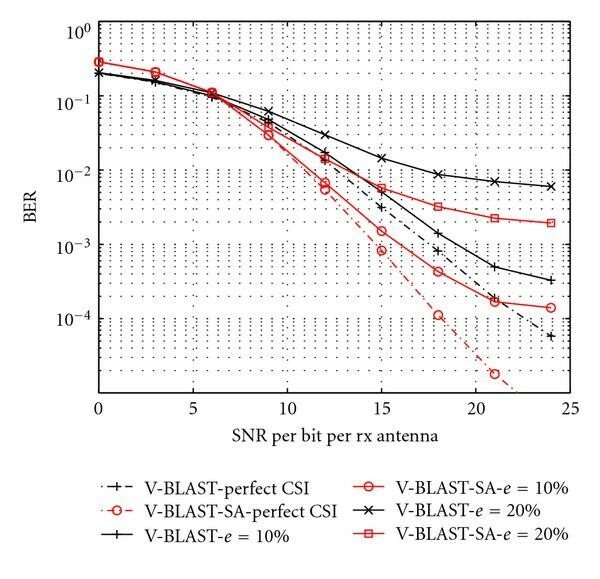 The performance of V-BLAST is investigated in Figure 9 where the bit error rate (BER) versus SNR per rx antenna is shown. The same MIMO system of , , is assumed. Again the performances for both mapping techniques are depicted to validate their equality. The performance of the system with error-free CS transmission is also included for comparison and it is obvious that the negative impact of the CS transmission on the performance of the system only exists at low SNR values. At higher values an SNR gain of 5 dB can be viewed for V-BLAST-SA compared to conventional V-BLAST. Notably the BER reduction for SNR = 20 dB is of an order of a magnitude which consists of a worthwhile improvement for this small scale MIMO system. Again the performance of the ED criterion (14) for the selection of , is also shown for comparison. Clearly, the proposed criterion benefits from allowing constructive interference in comparison to the ED criterion. BER versus SNR for V-BLAST, V-BLAST-SA with reordering or scrambling, projection-based optimisation and V-BLAST-SA with Euclidean distance (ED) optimisation , , , QPSK. 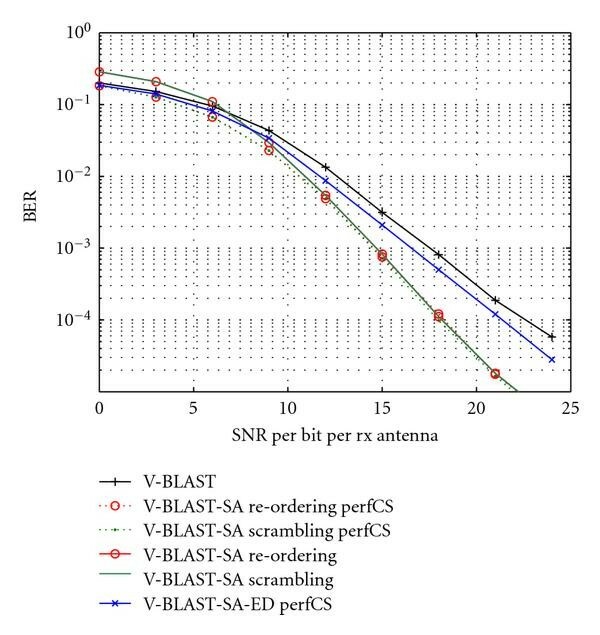 Figure 10 shows the BER performance for increasing number of antennas for the symmetric ( ) MIMO channel for the case of V-BLAST and V-BLAST-SA. Two sets of results are shown for the cases when the SNR per rx antenna takes the values of 10 dB and 15 dB. It can be seen that for practical values of to for point-to-point MIMO systems the proposed scheme considerably improves the performance of the conventional system. One can observe that the BER is improving up to a certain for both techniques. This is because the SNR per receive antenna is considered here, which for increasing antennas derives increasing total SNR. Therefore the performance naturally increases up to a certain point where the ICI becomes dominant in the system. Overall the proposed scheme outperforms conventional V-BLAST for all values of . BER versus for V-BLAST, V-BLAST-SA for SNR per antenna = 10 dB and 15 dB, , , QPSK. Here denotes the flat fading channel coefficient between the transmit and the receive antennas while represents the corresponding channel estimate. Results for % and % are shown and for reasons of comparison the performance graphs for perfect CSI are retained in the figure. It can be seen that the performance of the proposed V-BLAST-SA degrades in the same way as conventional V-BLAST for increasing CSI errors. In all cases V-BLAST-SA still outperforms conventional V-BLAST for the higher SNR values when CS detection is reliable. BER versus SNR for V-BLAST, V-BLAST-SA for CSI errors , %, %, , , , QPSK. The use of static data-to-antenna allocation leads to waste of useful energy inherent in the communication channel and makes conventional MIMO schemes suboptimal. By applying adaptive mapping on the data to be transmitted and introducing diversity in the interference between the transmitted symbols of the MIMO channel this work has shown that significant performance benefits are gleaned for MIMO systems. The tradeoff to this improvement is the need for control signaling for the correct data detection. Further work can be carried out towards reducing the CS overhead and applying the proposed scheme to further and more advanced MIMO techniques including resource allocation. This work has been jointly funded by EPSRC and Philips Research Labs, UK. The authors would like to thank Dr. Tim Moulsley for the helpful discussions throughout this research contribution.